Urbanknit will be popping up with over 40 designer makers selling everything from jewellery, ceramics, prints, accessories, homeware, clothing and Valentine’s and Mother’s Day cards and gifts. The shop will be open from the 27th of January to the 26th of February. We hope to see you there. Launch party this Saturday (27th of January)! Make sure you swing by. Urbanknit will be at the Homeworks Christmas Bazaar on Sunday the 10th of December. We will have our totes, zippers, clutches and more. With other fabulous designer-makers and alongside the Queen’s Park Farmers market, you really will be spoilt for choice for a spot of Christmas shopping and treats for friends and family. Your nearest tube stop is Queens Park on the Bakerloo and Overground lines and it is a short walk from there. Looking forward to seeing you there! Urbanknit will be at Homeworks, a Christmas bazaar in December. We’ll be sharing more information closer to the time. Stay tuned. 1:54 Contemporary African Art Fair has announced the galleries exhibiting in the fourth edition of the London fair, taking place in Somerset House from 6 – 9 October. 1:54 will showcase carefully selected and diverse presentations by 40 of the world’s leading galleries specialising in contemporary African art. The 2016 edition of the fair will feature 40 galleries from 18 countries: Côte d’Ivoire; Denmark; Egypt; Ethiopia; France; Germany; Ghana; Italy; Kenya; Morocco; Nigeria; Portugal; South Africa; Spain; Tunisia; United Kingdom; United States and Zimbabwe. 17 galleries will exhibit at the London fair for the first time in 2016: 50 Golborn; Addis Fine Art; AGorgi Contemporary Art Gallery; Barnard Gallery; Caroline Pagès Gallery; Galeria 111; Circle Art Gallery; Eric Hussenot Gallery; Gallery 1957; Gallery of African Art (GAFRA); Jenkins Johnson Gallery; L’Atelier 21; Officine dell’Immagine; Sulger-Buel Lovell; TAFETA; Tyburn Gallery; and Village Unhu. Over the past four years 1:54 has established itself as a leading voice in the global discussion on contemporary African art, and this year will spotlight the work of over 110 African and African Diasporan artists, working in various different mediums and coming from a unique spread of geographical backgrounds comprising 30 countries: Algeria; Benin; Cameroon; Côte d’Ivoire; Democratic Republic of Congo; Ethiopia; France; Germany; Ghana; Italy; Japan; Kenya; Madagascar; Malawi; Mali; Morocco; Mozambique; Nigeria; Russia; Senegal; Sierra Leone; South Africa; Sudan; Switzerland; Togo; Tunisia; Uganda; United Kingdom; United States and Zimbabwe. This year 1:54 will again be accompanied by FORUM, the fair’s extensive talks and events program, including lectures, film screenings and panel discussions with international curators, artists and art professionals. FORUM is curated by Koyo Kouoh, Artistic Director of RAW Material Company, Dakar. With Christmas only 4 weekends away, people are either thinking about what presents to buy or how to make some quick money, luckily we are holding a Winter Fair which will help arts and crafts lovers in either of these situations. On the 12th & 13th December from 10:00 – 18:00 at Chesterfield House, Create Space Members and designer/makers alike will come together to show and sell their bespoke gifts and artwork. It will be a family friendly event with a number of workshops taking place including, but not limited to, ceramics, screen printing, casting and electronics. Need more reason to attend? How about live music performances across both days, home made food (hot and cold, sweet and savoury) and a licensed bar. All of this is available with just £2 adult entry and kids go free. Alternatively if you would like to run one of our workshops, show off your musical talent or culinary skills, please come forward. Who can apply for a stall? We are offering stall spaces to Create Space Members and in addition we invite external stall-holders to offer an eclectic range of art and craft. The cost of a stall for Members is £10 per day and for external stall-holders £25 per day or £40 for the weekend. Applicants have until Monday 7th December 2015 to submit their details. Where will the Fair take place? Following a successful New York debut earlier this year, 1:54 Contemporary African Art Fair is set to return to London this October (15 – 18) to present its most substantial showcase yet. Taking place once again in the historic setting of Somerset House, the fair takes on an additional third wing this year and will feature 38 exhibitors representing more than 150 contemporary artists from Africa and the African diaspora. Edson Chagas (APALAZZOGALLERY) – winnner of the Golden Lion with the Angolan Pavillion at the 55th Venice Biennale and soon to exhibit at MoMa. Other highlights of this year’s fair inlcude: Aboudia (Galerie Cecile Fakhoury), Boris Nzebo (Jack Bell Gallery), Gonçalo Mabunda (Jack Bell Gallery), Ibrahim Mahama (APALAZZOGALLERY), Meschac Gaba (In Situ / Fabienne Leclerc), Romuald Hazoumè (October Gallery), Sokari Douglas Camp CBE (October Gallery), Virginia Chihota (Tiwani Contemporary)and many more. 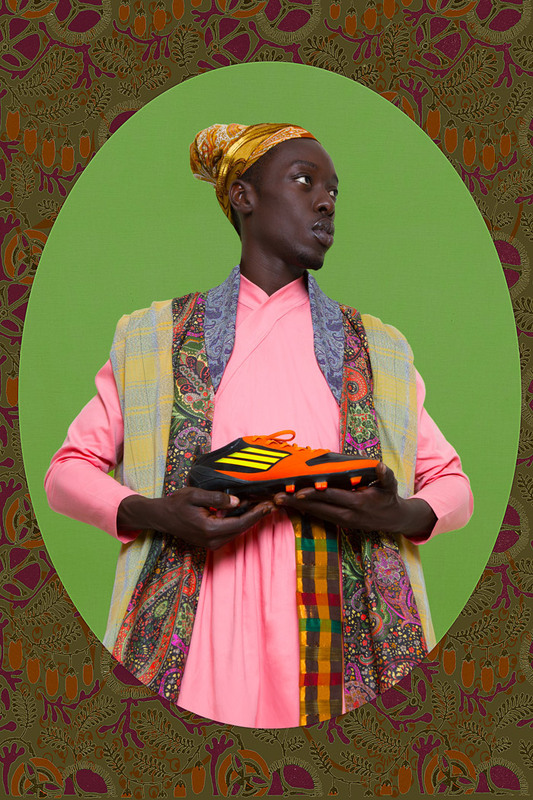 As well as 32 galleries, 1:54 will feature four special projects and two solo shows including a unique lounge area designed by Hassan Hajjaj’s Morrocan based Larrache Studio. The individual shows include Kapwani Kiwanga’s Flowers for Africa, an exhibition celebrating the independence of the 54 African countries through the reproduction of flower arrangements and a Kinshasa street life photography exhibition by Congolese artist Kiripi Katembo. Over the past three years, 1:54 has established itself as a leading voice on contemporary African art. 1:54 will host its hugely popular FORUM programme – a three-day critical conversations series comprising of artist talks, panel discussions and film screenings curated by Koyo Kouoh, Artistic Director of RAW Material Companyand curator of 2016 EVA International,Ireland’s Biennial. With a focus on North Africa this year,discussion topics will include the current trajectories of contemporary African artistic production and practice. The conversations will explore the cultural diversity of artistic traditions that form the rich universe of the African experience. The fair will be designed by award-winning architectural and design studio RA Projects (Rashid Ali). RA Projects will insert a series of richly coloured sculptural interventions across the East, South, and West Wings of Somerset House. Online platform Artsy will be producing an extensive digital catalogue of the fair at Artsy.net and on the Artsy iPhone app making it possible to experience the fair around the world. Africa Utopia is back for a third year celebrating the arts and culture of one of the world’s most dynamic and fast-changing continents. The festival looks at how Africa can lead the way in thinking about culture, community, business and technology and includes topics ranging from fashion, gender and power to politics, sustainability and activism. This year’s festival features some of Africa’s greatest artists across music, dance, literature and the arts. Highlights include: legendary drummer Tony Allen, one of the acknowledged co-founders of Afrobeat, performing with special guests; Senegalese super-group Orchestra Baobab; powerfully soulful West African singer Kassé Mady Diabaté; the ground-breaking launch of Europe’s first Black and Minority Ethnic classical symphony orchestra, Chineke! 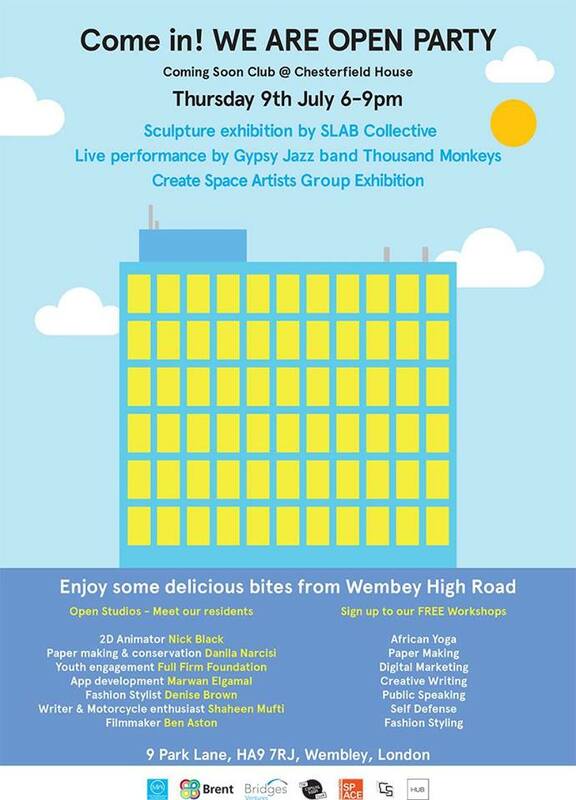 ; an original play called Star Boy Productions charting the migrant’s story of survival; emerging African musicians including Cameroonian Blick Bassy; and a club night showcasing the influence of Africa on a new generation of UK artists and DJs, including Afriquoi and African Head Charge. With something for everyone across the festival, join us to take part in lively Africa Utopia, free events, and workshops delving into the many faces of modern Africa. 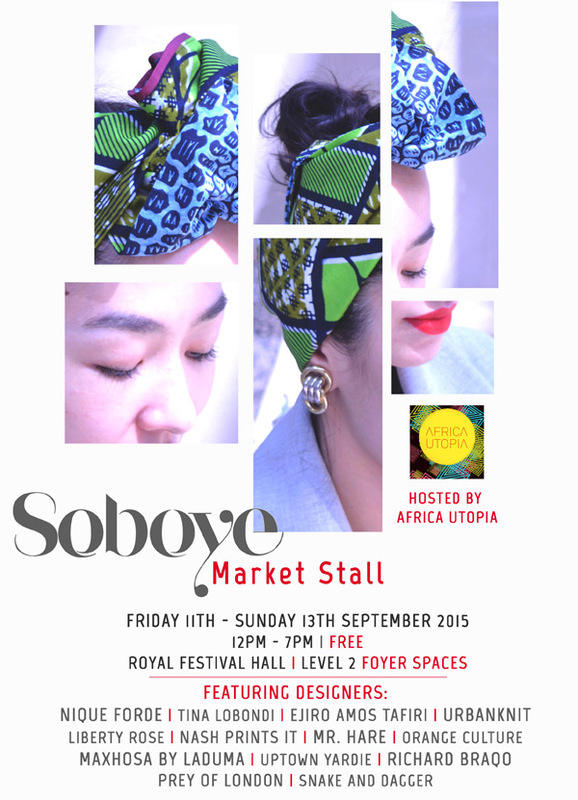 There’s also African-inspired fashion, a buzzing marketplace and delicious African street-food to enjoy. Be it food, debates, fashion or music,check out the event listings to find something that tickles your fancy. 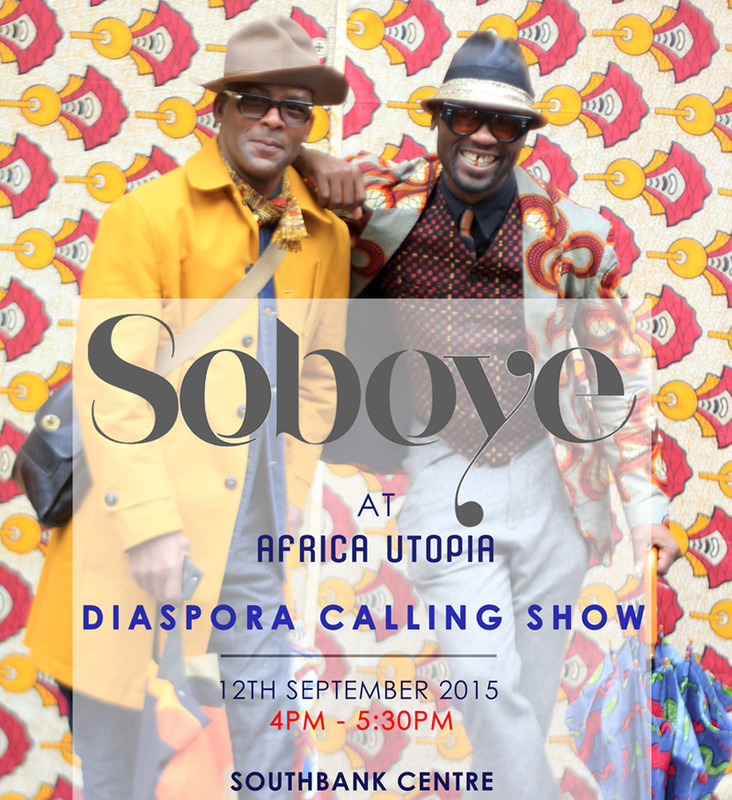 Urbanknit will be taking part in the Diaspora Calling fashion and will also be available on the Soboye Market Stall. This year’s edition edition of the Africa Centre Summer Festival takes place on Saturday, the 1st of August. ‘August in Africa’, will be held in Covent Garden’s iconic Piazza on Saturday, August 1st from 12pm-10pm and will explore the theme of portraiture through contemporary photography. Everyone with an interest in Africa will have an opportunity to celebrate and experience first-hand the best of African culture, including exhibitions, workshops for children and adults, pop-up fashion and dance shows, entertainment, live music, delicious African food and much, much more. And it’s FREE! Asa the Parisian born Nigerian singer songwriter will be performing at 8.15pm in the Piazza so definitively worth a visit with friends. In addition, you can try on (or even buy) Urbanknit clutches, totes, blazers and more at the Vou Brown Boutique stand. The Urbanknit London studio is based in Chesterfield House, Wembley. We’ve been here only a few months now and its time to celebrate that. On the 9th of July 2015, there will be an open studio day, so do drop by to have a drink, meet various artists and designers and get creative too! Let me know if you are in the area or if you are stopping by, leave a comment below! Yes, it is. 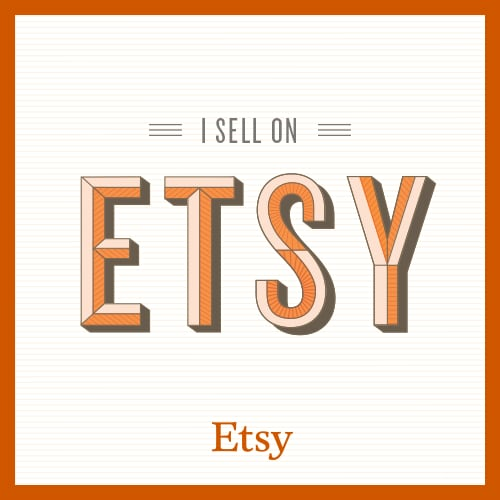 It is our 9th year on Etsy. We opened our Etsy store on the 20th of June 2006 and had our first sale on the 3rd of July just two weeks after. So here is a little celebratory song from Toni Tony Tone!